American sports bettors will be pleased to hear that one of the few online sportsbooks still open to U.S. bettors will be sending one lucky punter to Arizona for Super Bowl XLII. To celebrate the start of the NFL and college football season this weekend, Intertops is welcoming new customers with a $20 free bet and giving a 20% deposit bonus to all new and existing customers. While most sportsbooks have pulled out of the U.S. since last season, Intertops continues to accept deposits and pay out winnings reliably. Intertops was established in 1983 and has been one of the most trustworthy online sportsbooks and casinos since 1996. “Ever since we posted our NFL lines several weeks ago, we’ve welcomed many football fans deserted by sportsbooks that have left the American market,” said Michael Weiss of Intertops.com. One lucky Intertops.com NFL bettor will be attending the XLII game in Arizona February 3rd. Every wager on Intertops’ NFL regular season betting offers gives one entry into the end-of-the-season draw where the winner of the deluxe Super Bowl package will be drawn randomly. The prize includes luxury accommodation, airfare for two to Arizona and two tickets to the biggest game of the year. At +300, the New England Patriots are currently the favorite to win the Super Bowl. Intertops bookmakers favor USC (+250) to win the BCS Championship. In addition to Super Bowl and Rose Bowl wagers, the long-established gambling site offers a wide variety of NFL props including Spread Winner, Over/Under Totals and Straight Up bet on the outcome of the game. The popular casino, poker and sportsbetting site also takes First Half and Second Half Side, Spread Winner and Totals wagers. 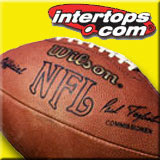 For anyone that thinks the Indianapolis Colts can top their recent 14 win season, Intertops.com’s Perfect Season proposition may be their best bet.